7.2 How does Field Papers Work? In this module we will see how we can record the coordinates of places without a GPS. 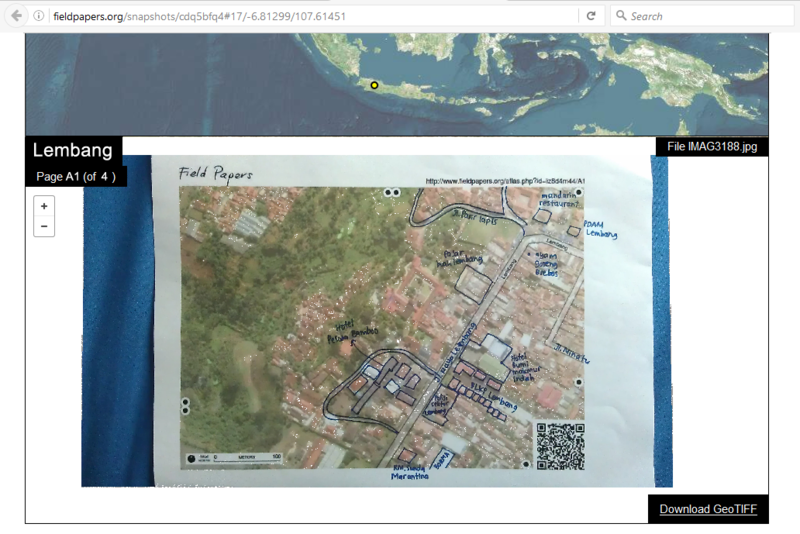 We will use a paper-based tool called Field Papers, which allows you to print a map of an area, draw on it, add notes, and load the paper back into JOSM, where you can add your locations to OpenStreetMap. 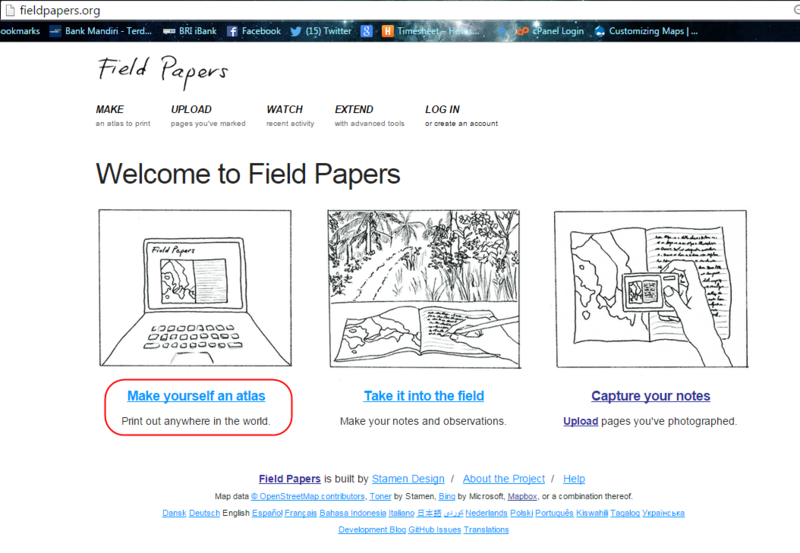 Locate the area of interest you want to map on the Field Papers website. Create a map for the area of interest. Print out a map of this area. You can choose to print the area of interest using the default OpenStreetMap backdrop, or you may choose to print aerial imagery, if it is a available in your area. Use your printed map to survey the area. Add more places by drawing them on the map. Draw lines for roads, shapes for buildings, and so forth. Write notes about each location directly on the map, or write numbers on the map that relate to numbers in your notebook, where you can write more detailed information about each object. Scan your paper into the computer. If you do not have a scanner, you can take a photograph of the paper, if your camera is able to take high quality pictures. Upload the image to the Field Papers website. In JOSM, load the Field Papers. 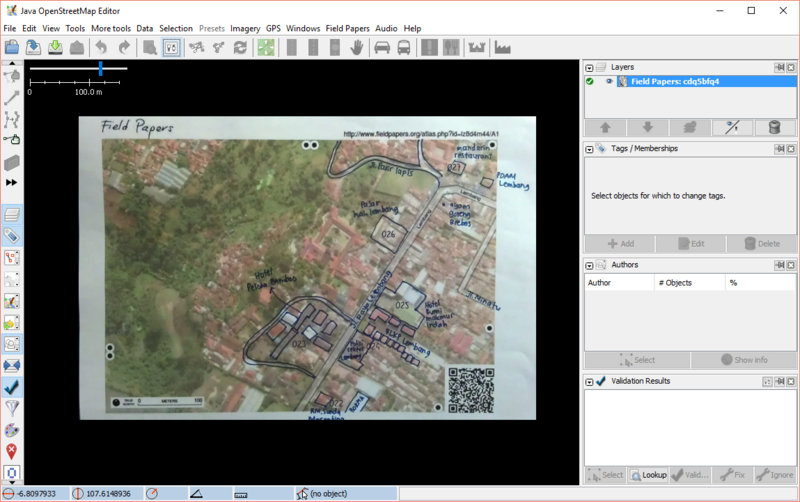 Use the objects you drew as a reference to add the digitally into OpenStreetMap. If you follow the Field Papers process described above, you will be collecting accurate geographic coordinate of places with nothing more than paper. How is this possible? When you print a Field Papers, the paper comes with a square barcode on the bottom of the page. 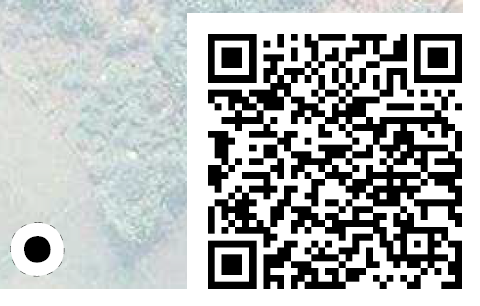 This barcode allows Field Papers to determine the exact location of the map that you are using to survey. Later, when you load the paper back into JOSM, all the objects that you drew will be in shown relative to their actual locations. This is same with you using GPS for collecting actual coordinates, except all you need is paper! Now let’s learn how to create and use Field Papers. Click Make yourself an Atlas to select the area that you want print out. You will be directed to a page like this where you can see there are some setting at left panel and main map at the right. 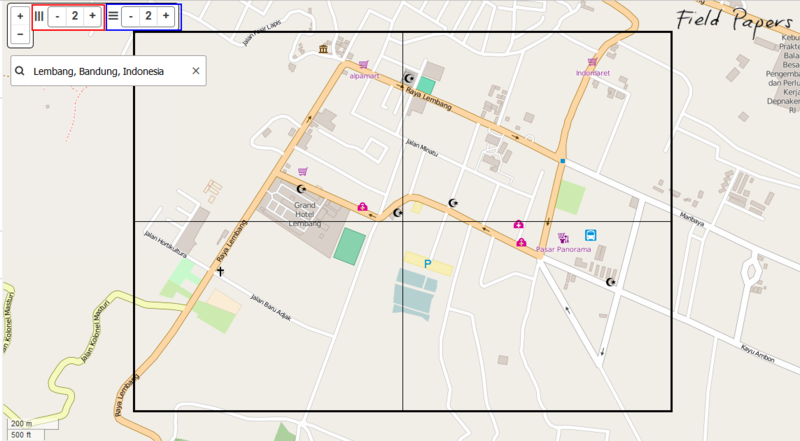 On the main map, to find the area that you want to map, you can click search button and type the location name OR you can drag manually the map with the same way when you drag map in OpenStreetMap website, use the left button your mouse for drag map, and scroll your mouse for zoom in and zoom out. Click on + and - buttons in the upper left corner for zoom in and zoom out. Here you also can define the boundaries of your Field Papers. The boundaries is displayed as hollow box with black border. You want to make sure that the window displays the area of interest that you intend to map. You can add more page or less page. 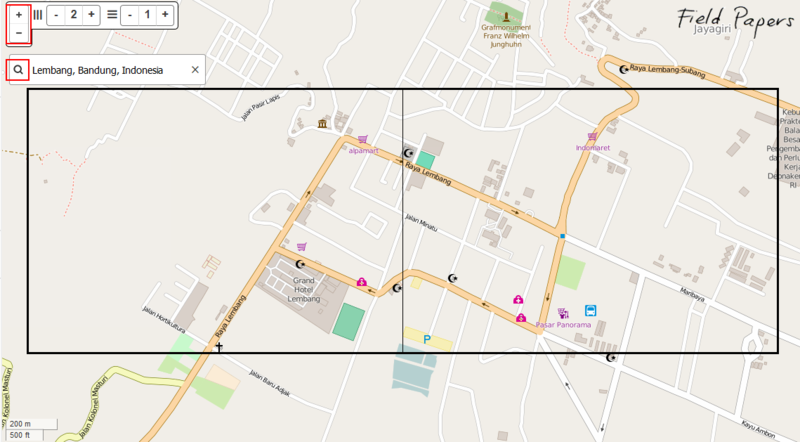 Make sure that your map can display building and road for field survey. At the left panel are some setting for print out Field Papers. The first is give information to your atlas by type a name on the Atlas Title column. 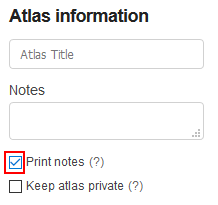 If you want, you can add notes to be printed on the map, such as questions you want to remember to answer or specific places you want to identity by give a check mark on Print notes and type your notes on the Notes column. The second is the Grid Layout setting. The Paper Size is used to adjust the paper size that you want use for print out Field Paper. You can choose letter, A3, or A4. 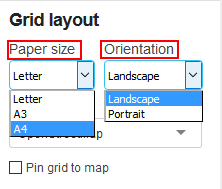 Then the Orientation is used to adjust the paper orientation that you want use for print out Field Paper. You can choose between portrait or landscape as shown in the figure below. 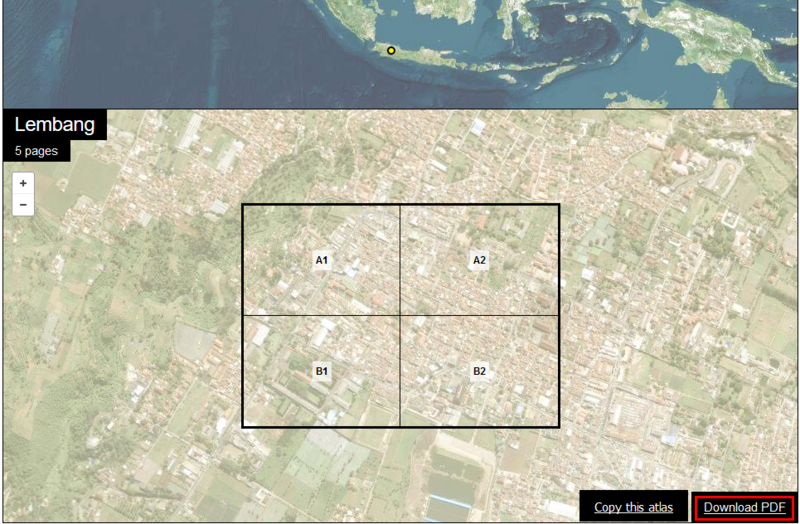 Still in Grid Layout setting, next you can select the type data for your Field Papers. 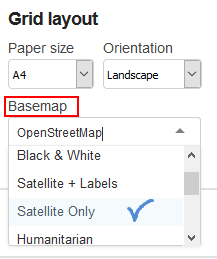 You can select different Basemap for change map background. In this example shown in the figure below, we will select Satellite Only. 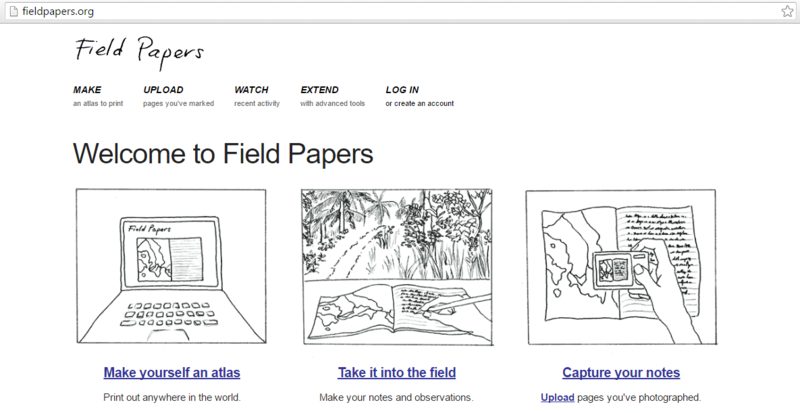 It may take a few minutes to prepare your final Field Papers map. When finished, you will see your Field Paper on this page, shown in the figure below. When your print is ready, Click Download PDF. 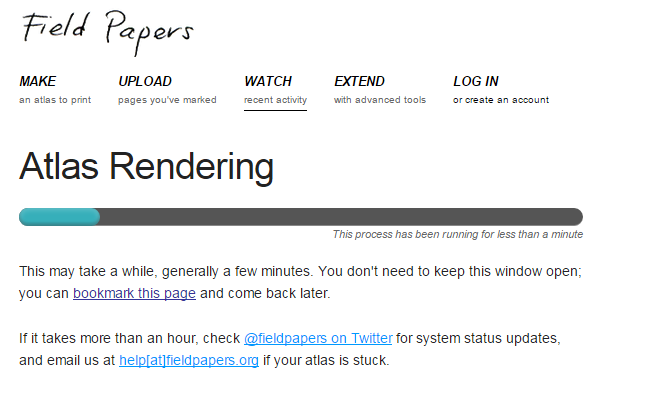 The Field Paper should begin downloading. If it loads in your browser, you may need to save it by going to File ‣ Save. When the download is finished, open the PDF file. Connect your computer to a printer and print the page. If everything goes well, you should now have map printed on paper. Take your Field Papers outside, and use it as a guide to walk and identify new places that are not on the map. Draw lines for roads, shapes for buildings, and so forth. Write notes about each location directly on the map, or write numbers on the map that relate to numbers in your notebook, where you can write more detailed information about each object. When you are satisfied with your additions on the paper map, then you can add them digitally into OpenStreetMap. Field Papers are very useful for mapping with nothing more than paper, but they are not a 100% solution. We will still need to load our paper map into JOSM, add our information digitally, and save our changes on OpenStreetMap. Once you have your Field papers scanned and saved on the computer, open your web browser and return to Field Papers website just as before. Click the Upload tab at the top of the page. 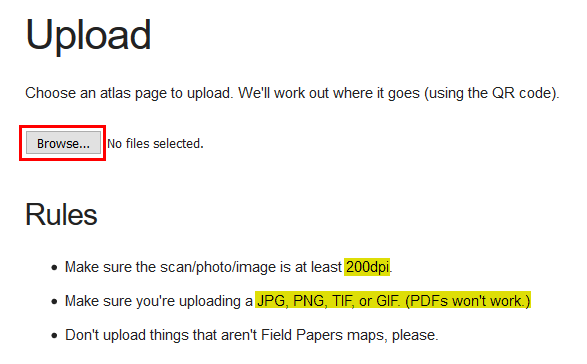 Click Browse... and navigate to the file where you scanned/photographed your Field Papers. It may take a few minutes for your paper to upload, depending on the speed of your connection. Before we open Field Papers in JOSM, we need install the Field Papers plugin. 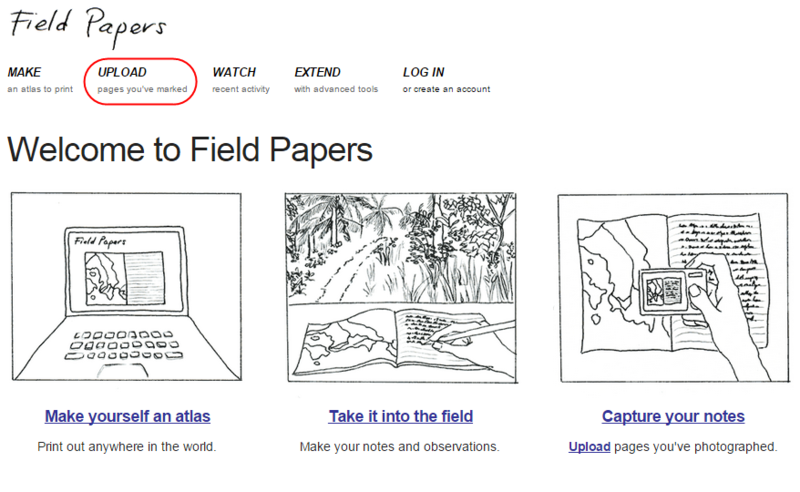 The fieldpapers plugin enables JOSM to open Field Papers that have been uploaded to the Field Papers website. The Field Papers will be used as background, and we open it using the same procedure for opening satellite imagery in JOSM. Open JOSM and go to Edit ‣ Preferences. 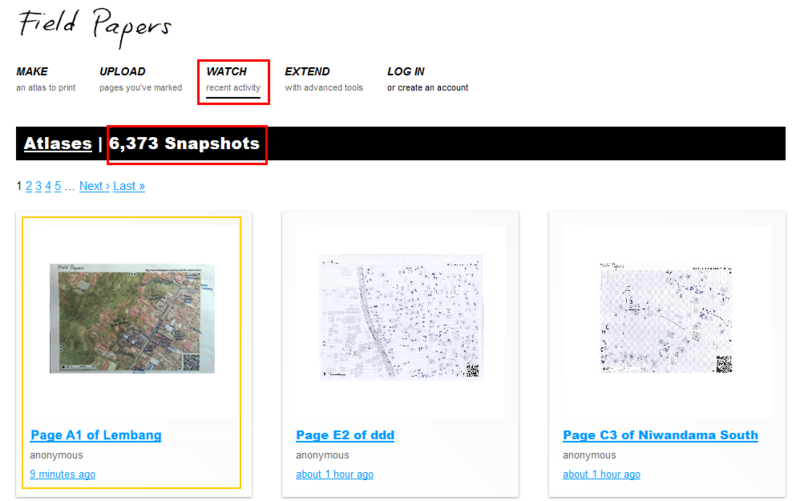 Type fieldpapers in the Search box. After you find it, tick the fieldpapers box and Click OK as shown in the figure below. Restart JOSM so the plugin loads. 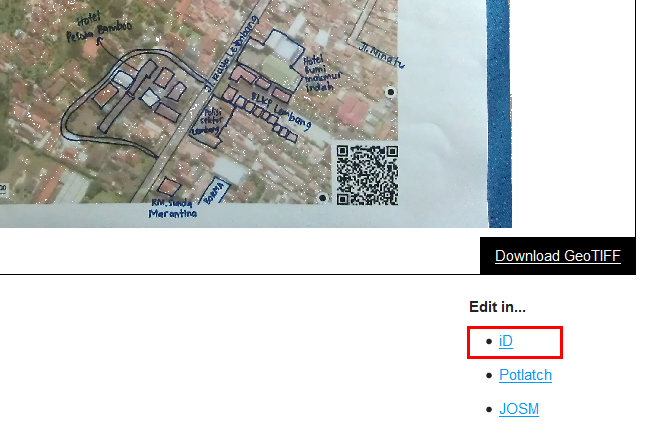 Now you can add the results of your scanned Field Papers to JOSM and add your information to OpenStreetMap. Return to the Field Papers website in browser address bar. Copy the URL by selecting it and pressing CTRL + C.
Then paste the URL that we have copied from the Field Papers site by pressing Ctrl + V on your keyboard. If everything goes well, the Field Papers will open in JOSM. 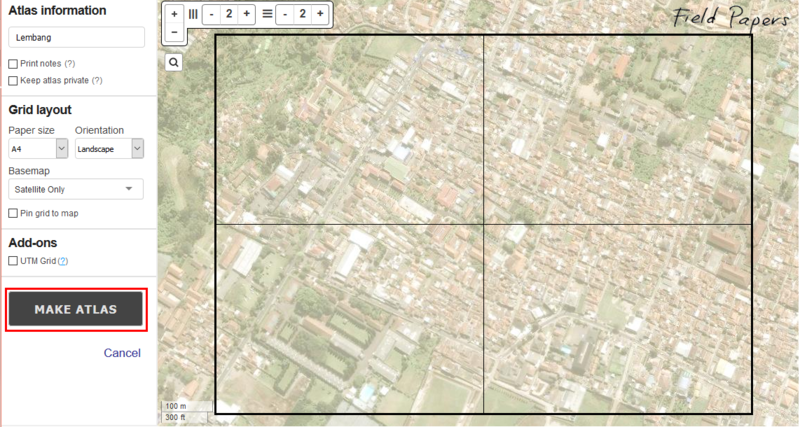 The next module, we can see how to add objects from the scanned Field Papers to OpenStreetMap. Also note that you can use scanned Field Papers in other online editors such as ID Editor or Potlatch2 by clicking the link Edit in... ID or Edit in... Potlatch on page Field Papers that have been scanned. After you add your changes to OSM, they will be saved to the OSM servers. When you want add some information to your map, you can print a Field Paper that includes the changes you made. As this process is repeated, and you acquire more details, the map will steadily improve! In this module, You have learned how to use Field Papers and how Field Papers works as a data collection device. 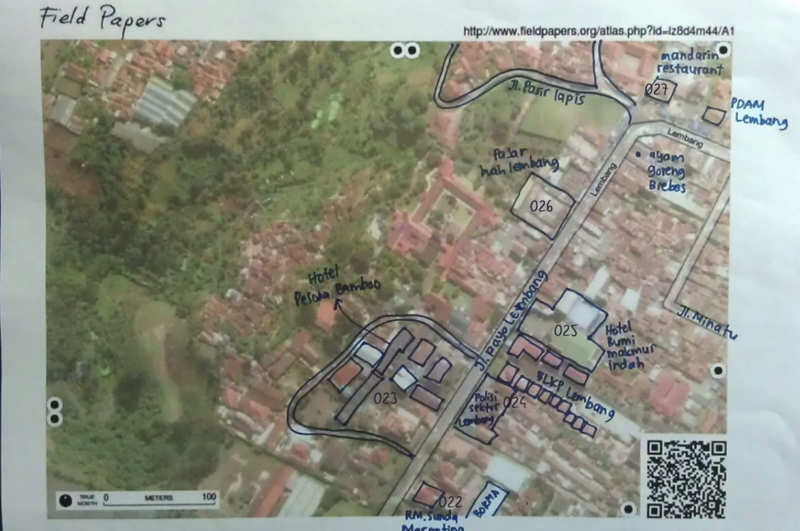 You have learned how to print, mapping, and scans Field Paper, and how you can use them to improve OpenStreetMap.